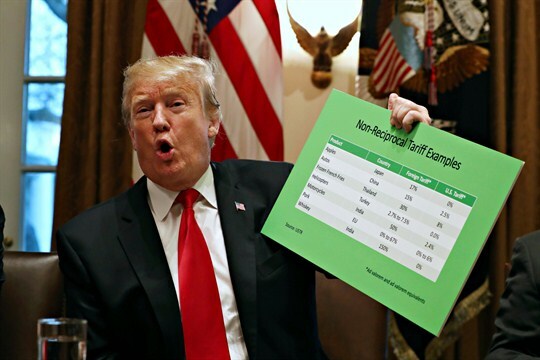 President Donald Trump holds up examples of foreign tariffs in the Cabinet Room of the White House, Washington, Jan. 24, 2019 (AP photo by Jacquelyn Martin). President Donald Trump likes to claim that the tariffs he has imposed on steel, aluminum, washing machines, solar panels and a variety of other imports are forcing foreigners to pay for the privilege of selling their goods in the American market. But what does the data say? Are American firms and consumers in fact paying the price?